Trent Nelson | Tribune file photo Rep. Sandra Hollins, D-Salt Lake City, speaks as the Utah House debates the Prison Relocation Commission's recommendation to build a new correctional facility in Salt Lake City before voting to approve it, in Salt Lake City, Wednesday August 19, 2015. The House on Monday passed a resolution sponsored by Hollins to remove a slavery exemption from the Utah constitution. Joining the resolution’s sponsor, Rep. Sandra Hollins, on the House floor for the votes was Joan Trumpauer Mulholland, a civil-rights activist and Freedom Rider. The measure, HJR8, deals with a section of the constitution banning slavery and involuntary servitude, seeking to delete an exception that allows these practices as punishment for a crime. The language appears in several state constitutions and is taken from the 13th Amendment of the U.S. Constitution. “This no longer reflects who we are as Utahns, and it no longer reflects our values or where we are trying to move to as a state,” Hollins, D-Salt Lake City, said on the floor. 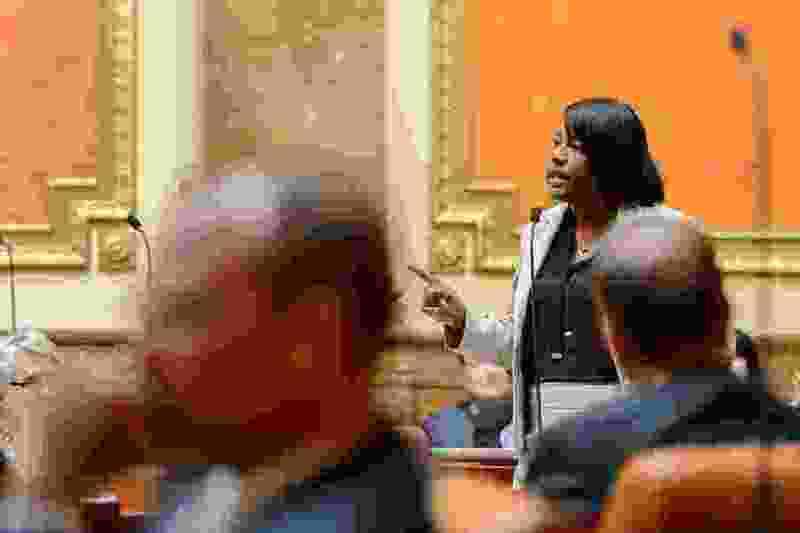 After unanimously approving the resolution, lawmakers stood and gave Hollins, the only black member of the Utah Legisalture, a standing ovation. The legislation will now move to the Senate for consideration. If it passes both sides of the Legislature by a two-thirds majority, it will come before voters for a final decision in the 2020 election. Trumpauer Mulholland, who lives in Virginia and was in Utah visiting her son in Lehi, participated in sit-ins and worked to desegregate buses and trains as a Freedom Rider in the 1960s, facing threats and once was named on the Ku Klux Klan’s most-wanted list, Hollins said. “Because of the work she did during the civil-rights movement, I can stand on her shoulders and stand before you today,” Hollins said Monday, her voice cracking with emotion. Trumpauer Mulholland said Utah is “leading the way” in removing the slavery exemption from its constitution and that she hopes other states and the nation follow suit.